My 10-year-old son, Casey, was so excited when I got this book in the mail, and asked him to read it. He had no complaints, and dug right in. When he was finished, he said that he really liked Benotripia, and that it was a really good book full of adventure and magic – two things he loves. He said that he always wanted to know what would happen next because the book was exciting and full of surprises. The main characters in the book are Roseabelle, Astro, and Jessicana – three friends in magic school. When Roseabelle’s mother, the queen, is kidnapped, these three friends go on a quest to find her. The book is a trilogy all in one, so each quest leads to a new quest. All three main characters have powers to help them. Roseabelle is the most powerful, one of her powers being the ability to turn into a dolphin. Astro shoots lightning out of his fingers, and Jessicana can turn into a bird, often acting as a scout. Casey’s favorite character was Astro, because his power was the coolest. He liked how the main characters were selfless, and were always there for each other. The message, to always stand up for your friends, was clear in the book, as well as that greediness will always lead to downfall. Casey recommends this book to kids ages 8+ who enjoy adventure and magic. The book is not that scary, and is about a medium read. He was satisfied that by the end of the book, there were no holes unfilled or questions unanswered. He would love to see another series about these same characters though, with more bad guys and more missions. Overall, Casey feels this book deserves 5 stars. It had no flaws, and was great from beginning to end. He even likes it better than Percy Jackson, and is super impressed at the young age of the author! Discover the land of Benotripia–where adventure is around every corner. Now you can own Mackenzie Wagner’s debut fantasy series in one complete volume. 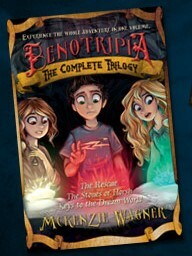 Written when Mackenzie was in middle school, this thrilling series is perfect for middle grade readers. Join Roseabelle, Jessicana, and Astro as they use their magical powers to battle the Darvonians and save their home! McKenzie Wagner is thirteen years old and has adored reading since she was four. Her love of books inspired her to write a book of her own, and she completed the first book of The Magic Wall Series, The Magic Meadow and the Golden Locket at age seven and the second book, The Blue Lagoon and the Magic Coin, shortly thereafter. She has now expanded her writing to appeal to kids of all ages. She wishes to obtain an English degree and teach and continue in her pursuit of her love of writing. She currently resides in Utah with her mom, dad, and her nine-year-old brother, Ty.